U.N. Secretary General Antonio Guterres said Wednesday concrete steps are needed toward nuclear disarmament and the adoption of an international nuclear ban treaty serves as "useful pressure." Guterres, becoming the first sitting U.N. chief to attend a memorial ceremony on Thursday to mark the 1945 U.S. atomic bombing of the city, said the Treaty on the Prohibition of Nuclear Weapons is the result of frustration felt by many countries. The pact is "a form of useful pressure for effective, positive measures in disarmament" to take place, he said in an interview with Kyodo News. Atomic bomb survivors have been urging the Japanese government to sign the treaty, which was adopted in 2017 with the backing of more than 120 members. According to the U.N. chief, he hopes to express his solidarity with hibakusha atomic bomb survivors. 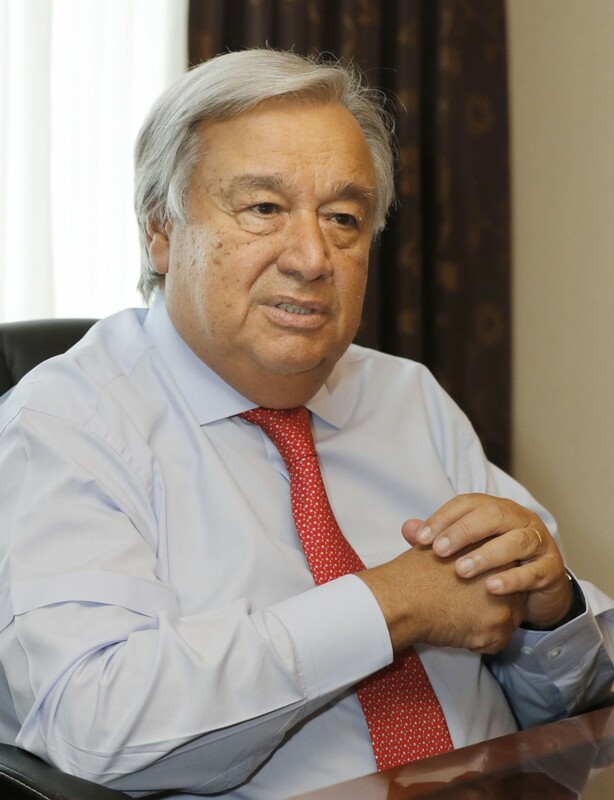 "When we see nonproliferation at risk, and when we see a lack of commitment to disarmament, to amplify the voice of the hibakusha becomes more and more important," Guterres said.